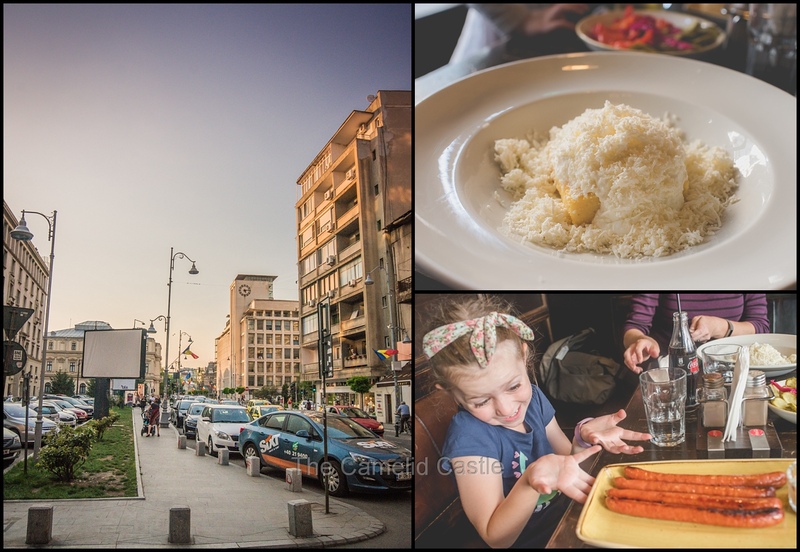 Our final few days of the trip took us East to Bucharest, Romania. 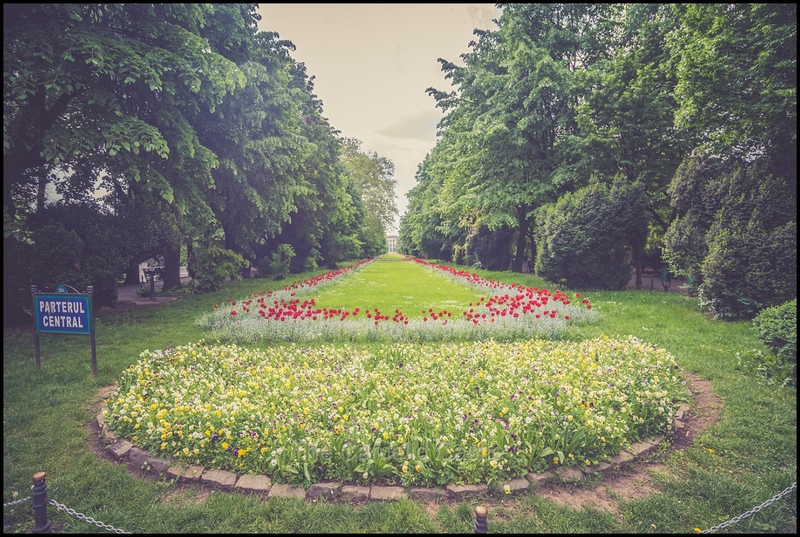 We finally got some sunshine, warm weather and plenty of leafy green parks to wander. We also visited the Palace of Parliament, the world’s second biggest administrative building and indulged in some fabulous local food! 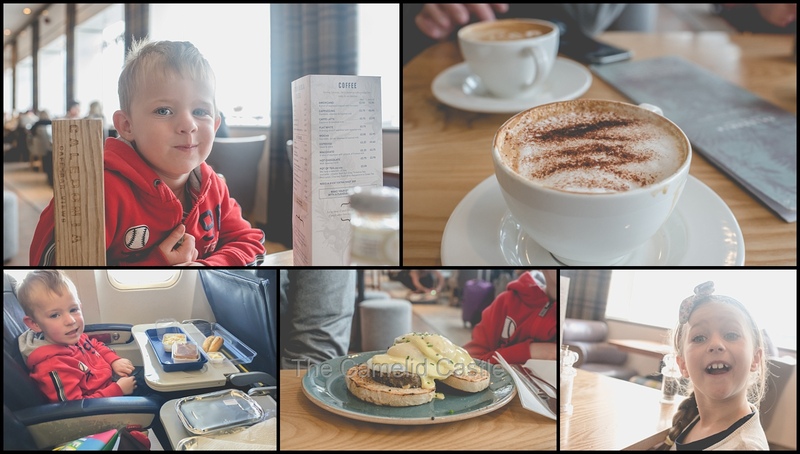 After a long last day in Scotland, as we drove from the Isle of Skye back to Glasgow, we were all tired but the kids were keen to get to moving for the final country of the trip and woke us up at 6.30am – 20 minutes before the alarm for breakfast. The hotel room was the size of a shoe box so we we quickly packed their sofa bed back into couch mode so we could move without turning sideways and got dressed. It was down to our included breakfast at the Holiday Inn. Being an airport hotel, breakfast was served from 4am, but despite it claiming to be a ‘full Scottish breakfast’ it was a disappointing end to our time in Scotland with some toast, cereal, average croissants and some powdered egg and something that was apparently bacon, and sausage. The coffee was undrinkable and I really was pretty much willing to drink anything at that stage! Anyway, we all put at least something in our tummies then wandered upstairs to brush teeth and make sure all our bags actually did up. After over 5 weeks away we were now definitely back into 4 bags with all the random bits and pieces we seem to have accumulated along the way. The hotel was right on the edge of the airport car park, and there were baggage trolleys outside the hotel entrance, making for an easy stroll with 2 laden trolleys over to check in for our flight. The hotel had definitely been picked for convenience over style and quality! We made it to check in by 7.50am, with plenty of time to spare. For the journey east to Romania we were flying Blue Air (a low cost Romanian airline) but all the check in staff were definitely Glaswegian. Our only hiccup for the morning was our row 2 seats being unsuitable as one side was an exit row, which we should never have been put in with kids. This meant getting shafted back to row 8. We were through security without any dramas, and made a last minute purchase of more Scottish shortbread for the kids. We had been so efficient we didn’t even have a gate number yet, so sat down for an actual coffee. Anto was needing one last Scottish meal fix so ordered the haggis benedict (yes that is apparently a thing) that the kids stole plenty of. Our kids seemingly like haggis….. Finally we had a gate and it was down to board. It turns out there was no one else in our row as the flight wasn’t full, so we ended up with 6 seats between the 4 of us. The air hostesses kept talking to us in Romanian and acting surprised when we didn’t have a clue what they were talking about. It appeared most of flight were Romanian and only a few British people scattered around and us random Aussies! The flight was scheduled for 3.5 hours. 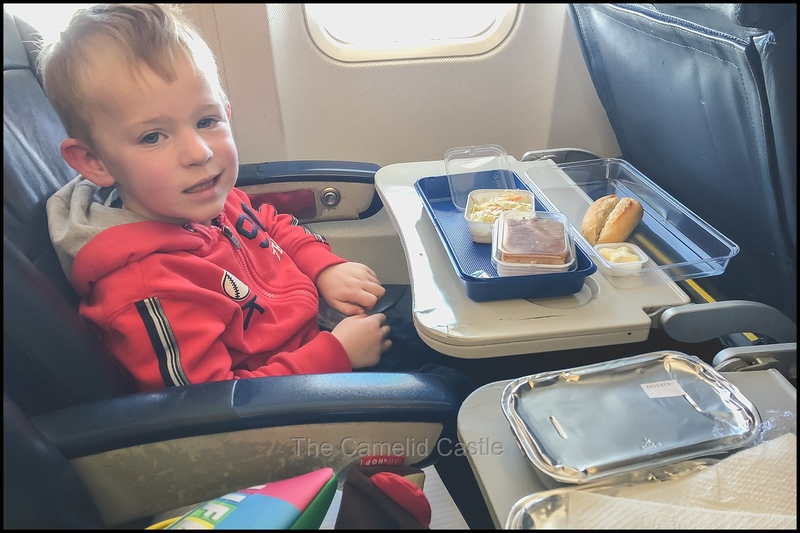 We had meals included with our upgraded pre-purchased luggage package, but turned out they gave everyone a meal. You couldn’t pre-order them,so they looked confused when I asked if they had anything vegetarian. Apparently there was, but it was going to take 20-30 minutes as they had to heat it up. I said that was fine as it was less than 3 hours since breakfast, and the hostess seemed annoyed that I hadn’t just decided to give it a miss. Half an hour later my tomato pasta did turn up, and was at least something to pass the time! You did have to buy any drinks you wanted, but could only pay cash and we’d used the last of our pounds and had no Romanian Ron yet so no drinks for us….. The kids were both tired, and being a low-cost airline there were no entertainment systems. They had plenty in their bags to keep them occupied, but by the time they’d eaten we convinced them to try napping. Soren eventually gave in to sleep and Astrid wasn’t far behind. Anto and I also tried napping but there was an annoying 3 year old in the row in front of us who was jumping up and down the aisles and climbing in our seats while being ignored by his parents. It appeared Blue Air crew were similar to Alitalia and didn’t seem to care if people had seat belts on, tray tables up or were sitting in the aisles during the flight. Despite the annoying nearby passengers, the flight passed pretty quickly and the kids only woke up as we sat them up for landing. After 5 weeks in cold to freezing temperatures, we were about to get some seriously warm weather with he temperature on the ground, at 3.30pm, being 28 degrees. We sped through immigration and then waited almost half an hour for our bags to appear. We’d decided to be lazy and get a taxi into the city rather than deal with buses and trains with all our luggage, when tired and hot. Our research indicated taxis should have been fairly cheap but it didn’t work out exceptionally so. 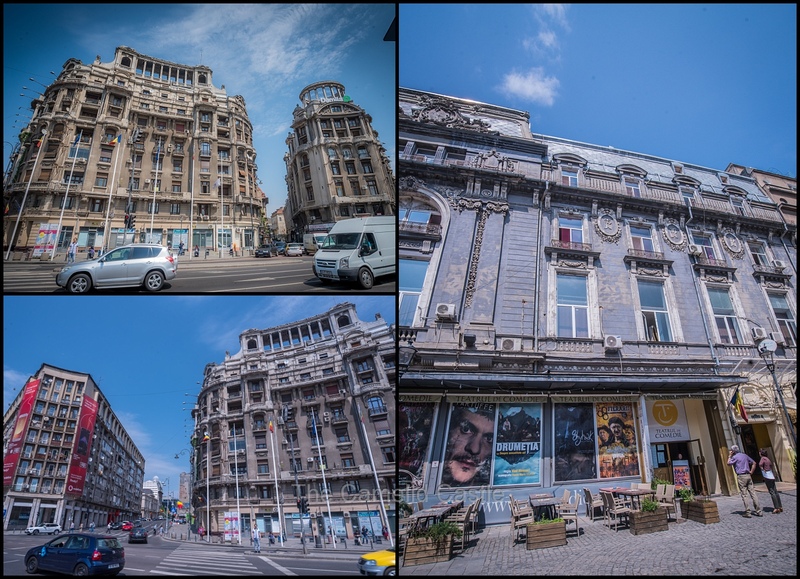 Anyway, it was very low-stress and our taxi driver was friendly and pointed out lots of things to us as we were driving through Bucharest. We annoyingly hit peak hour as it was now 4.30pm so the trip took over 30 minutes, rather than the anticipated 15. Both kids were complaining about being hot, and we were passing road signs saying it was 34 degrees. We hadn’t packed for any really hot weather so were all in jeans and the lightest shirts we could find but were still a bit over-dressed. Our Airbnb apartment hosts had messaged as we’d landed to say our apartment had been switched due to a problem with the original one. The new one was smaller but in a similar location. The switch made us a bit nervous and the original apartment had plenty of bedrooms, so we had been looking forward to separating the kids for a couple of nights. Luckily once we got to the new apartment and it was quite nice and still big enough to spread out a little. 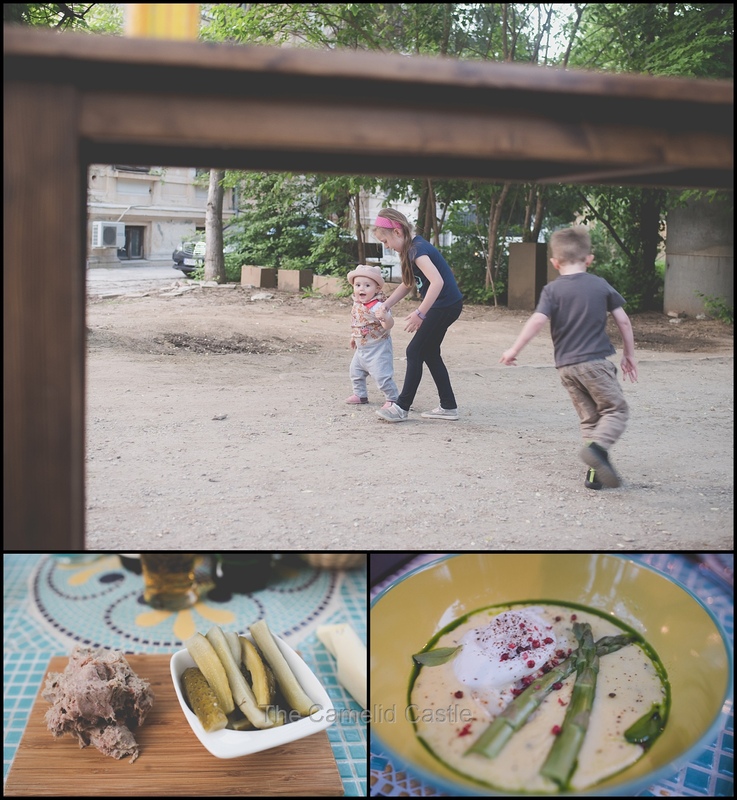 We were all hot and tired, and the kids were wanting to nap but with losing 2 hours due to the time change we convinced them they really needed a walk and to get some food as it was almost dinner time. 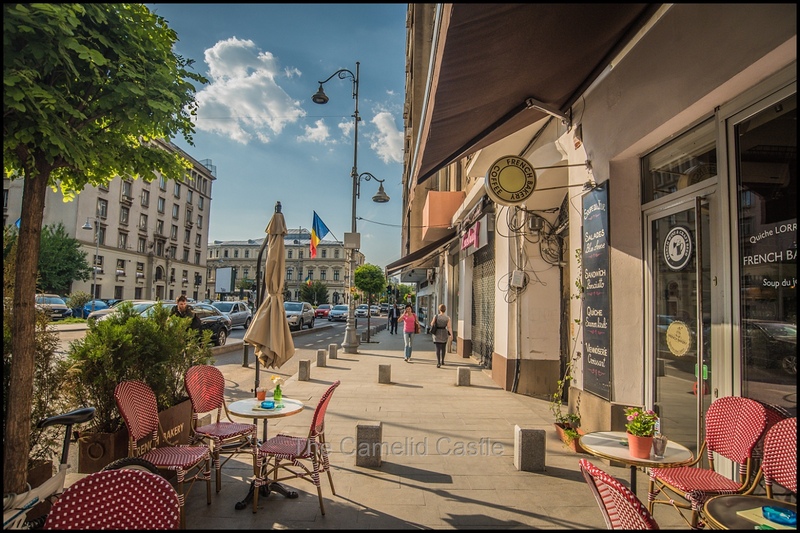 We ventured out in the late afternoon Bucharest sunshine for a short wander around the nearby streets. 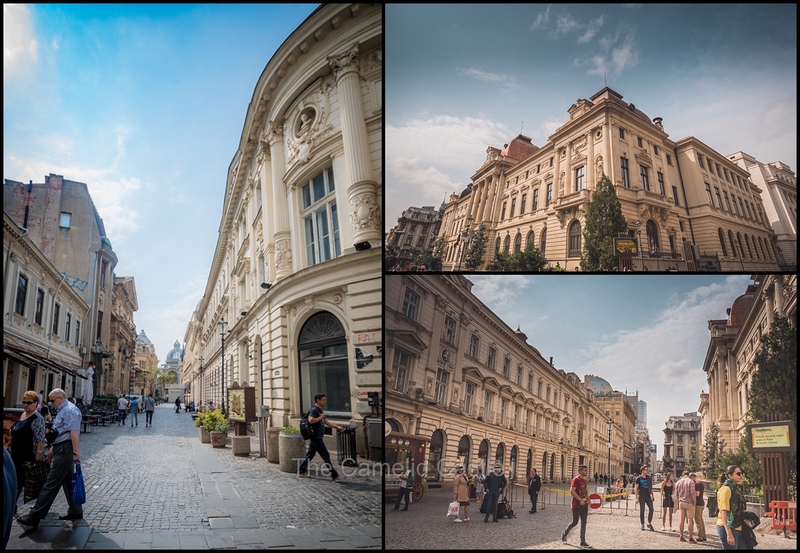 Bucharest is known as ‘the Paris of the East’ and we immediately noticed the French influence, with similar street signs and a large number of French inspired patisseries. 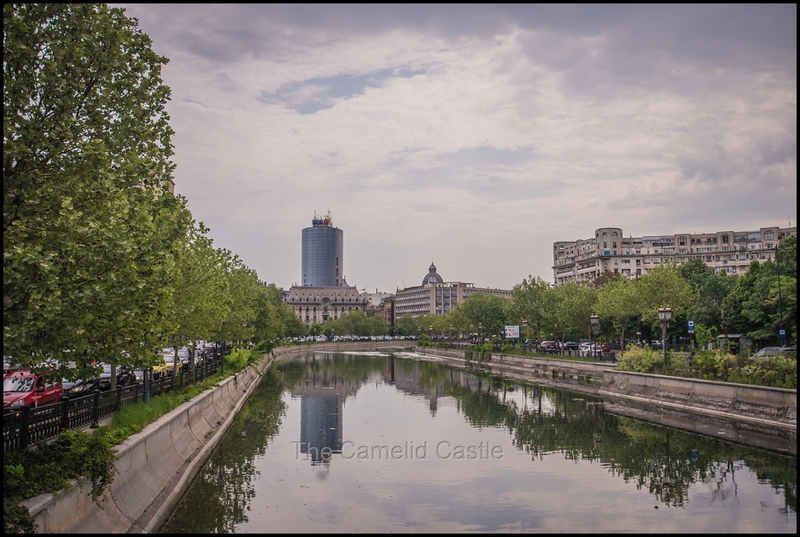 Bucharest is in the South of Romania, only 60km from the border with Bulgaria and home to approximately 1.8 million people, making it the 6th most populous city in the EU. We wandered past quite a few street markets and checked out a few restaurants for dinner options. Our apartment owner had recommended a nearby pub as having good Romanian food. None of us were all that hungry as it was still not dinner time in Scotland, but we needed the kids to eat something as we hadn’t had much all day. We located the pub and it looked OK, and fairly cheap so decided to give it a go. 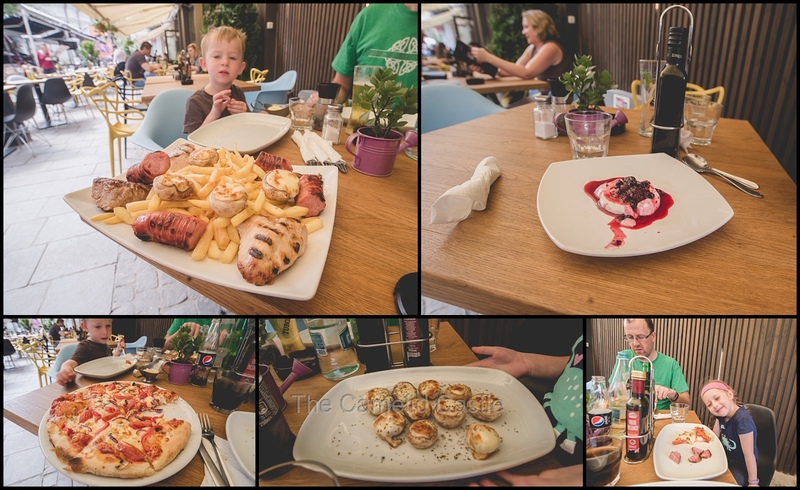 Despite tonnes of options including Italian and burgers and chips we decided to order some Romanian specialities to share, which turned out to be a good move. We ordered smoked sausage which came with mustard and toast, which the kids devoured. A pickle salad (a variety of pickled veggies), a grilled eggplant dish with tomato, and a polenta dish which had sour cream and parmesan. All were really tasty and quite cheap. Even including our drinks the whole meal was about 25 AUD and we couldn’t finish it all…….. The kids blissfully slept in til around 7.30am, which was a pretty decent sleep with the time change. We hadn’t bought a lot of groceries with the kids being over-tired the night before, but still managed to make fried eggs in bread and some toast, despite discovering that there was no toaster and no mugs for coffee in the whole apartment, presenting a few challenges! For the first time in quite awhile we didn’t have a hectic schedule for the day so we didn’t rush breakfast and had a leisurely morning planning our sightseeing for the day. It was after 10.30am when we went out and a little bit colder and more overcast than the previous day, which was a pleasant change. 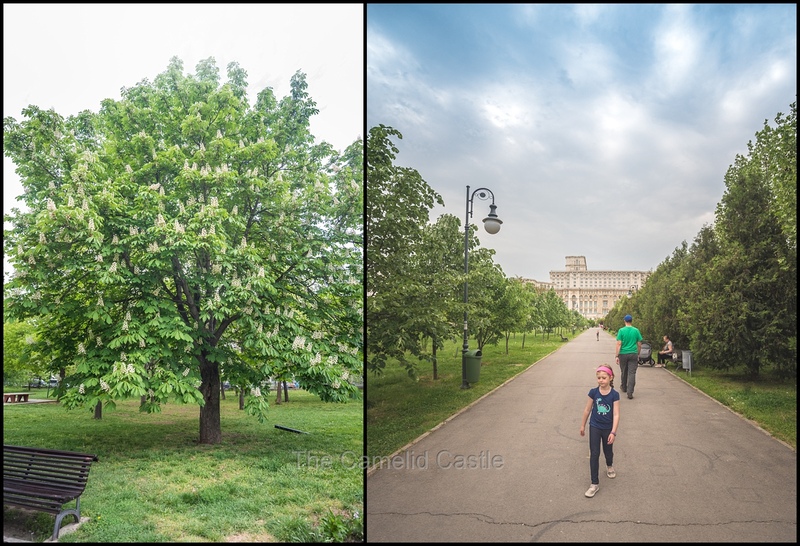 On our drive in from the airport we had noticed Bucharest had plenty of green, leafy parks, and there were certainly plenty dotted around. 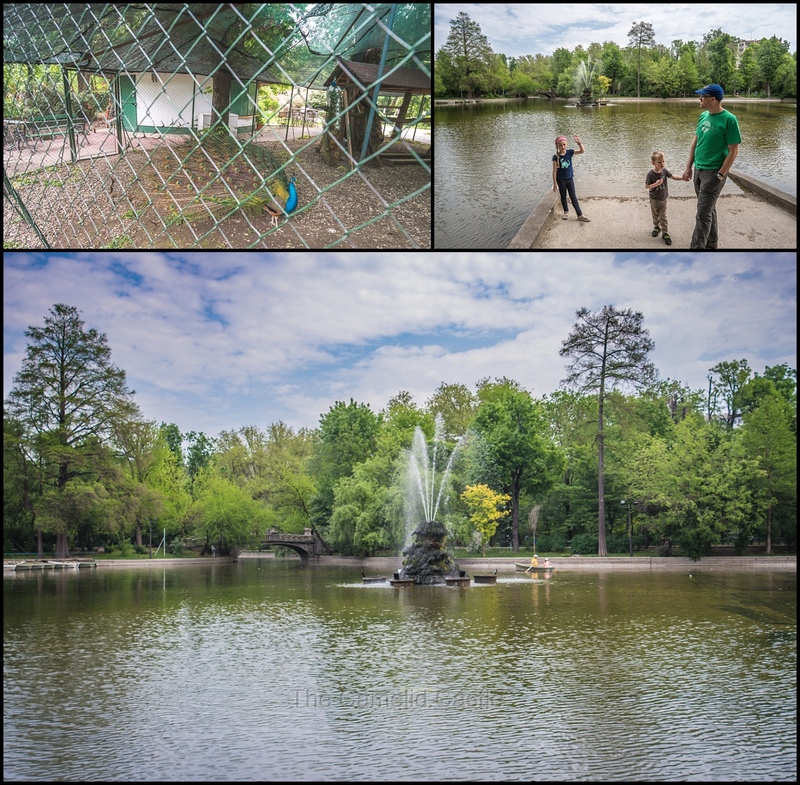 We started our walk through ‘Parcul Izvor’, a 17 hectare park on the right bank of the Dâmboviţa River, opposite our next stop for the day the Palace of Parliament. The park was full of beautiful smelling wisteria, pretty Spring bulbs and large ponds that you can hire row boats to cruise around. There was also a duck enclosure with curiously, a couple of black swans and a peacock enclosure. The park had plenty of playground areas, and the kids were desperate to go in, but they seemed to be overflowing with preschool groups and we were trying to do some sightseeing before park playing. We did noticed that there were plenty of ice cream vendors within the parks, a fact that also did not escape the children’s notice. It was a pleasant leafy stroll towards the Palace of Parliament, which we had managed to spot from a fair distance away, not surprising given it’s the second biggest administrative building in the world (behind the Pentagon). While it’s easy to see from a distance it actually doesn’t look as big as you’d think from the outside! As we approached the Palace of Parliament it was now just on 11.30am. You can only tour the building as part of a tour group and we had just missed the start of the 11.30am tour so decided to book onto the 12pm tour, which involved handing over all our passports and a few Romanian Ron. 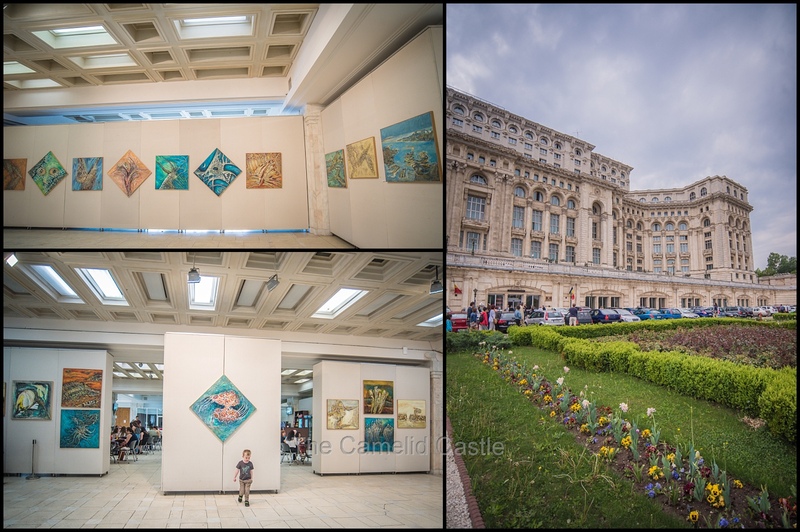 While we waited for our time to report for security screening we had a look around the art gallery in the building foyer and at some of the gardens in the front of the building. Right on 12pm it was time for our tour to start and we gathered with 40-50 other people to have our passports inspected and an airport style security screening. Our tour guide was a young woman who spoke excellent English but like most Romanians, spoke at a very rapid pace. The tour started with a history of the building and it’s construction. 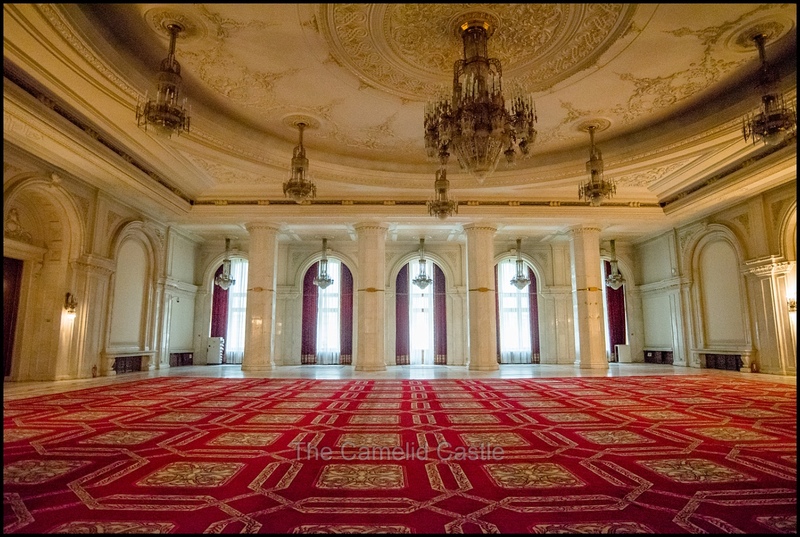 The Palace has a height of 84 metres, a floor area of 365,000 square metres and a volume of 2,550,000 cubic metres. The Palace of the Parliament is the heaviest building in the world, weighing about 4,098,500,000 kilograms. Construction started in 1984 and was only supposed to take 2 years. It was immediately obvious why it was the most expensive administrative building ever constructed (at approximately 3 billion Euros) and it’s not even finished with only 400 of the 1100 rooms are finished and used. 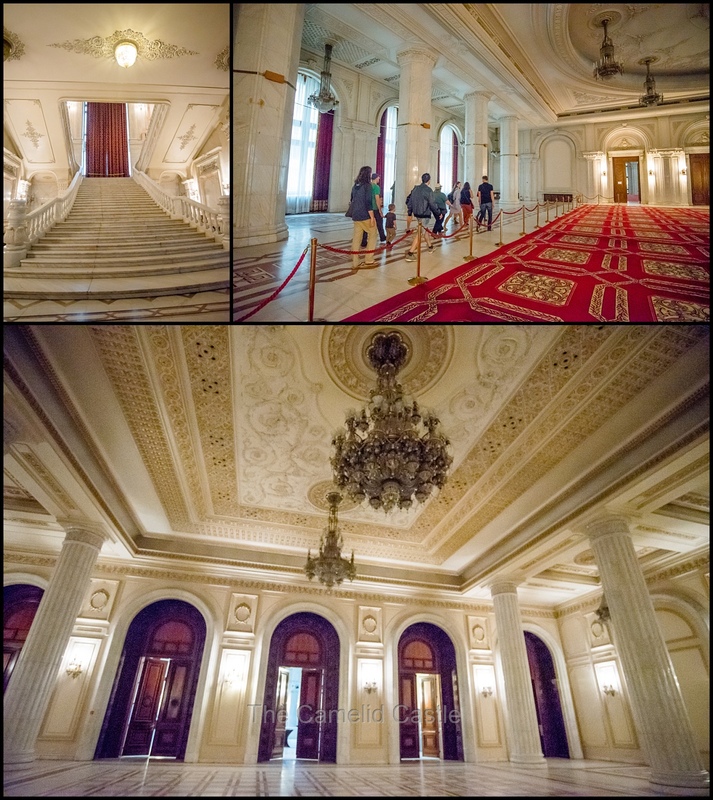 The building is full of intricate marble flooring, ornate roofs, huge chandeliers and absolutely massive rooms. 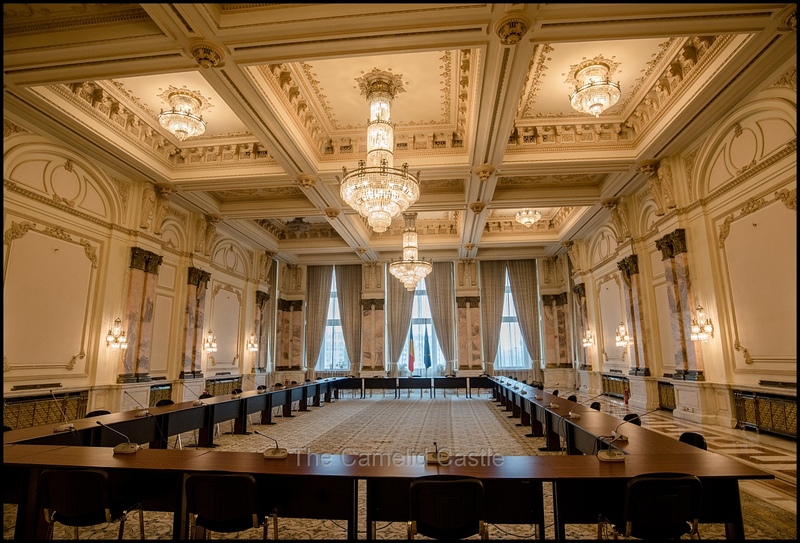 Most of the rooms are empty but some are used for conference rooms. Part of the building is used for administration and other sections for Parliament (this section is largely unfinished). 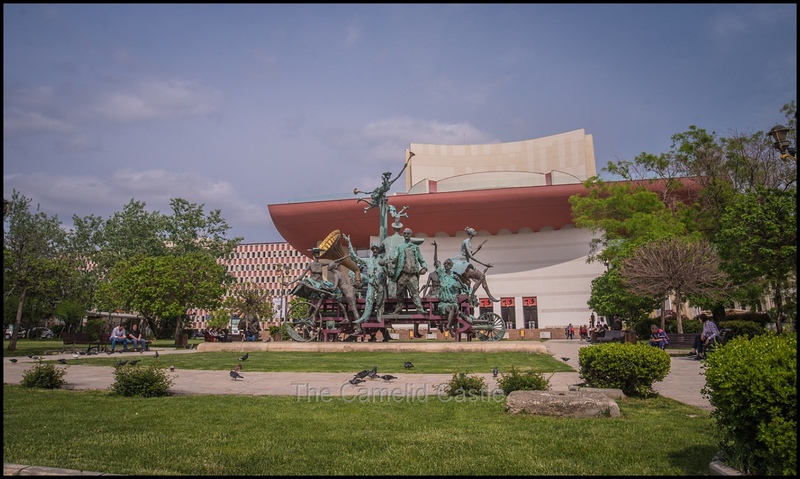 The building also houses 3 museums but over 70% still sits empty. 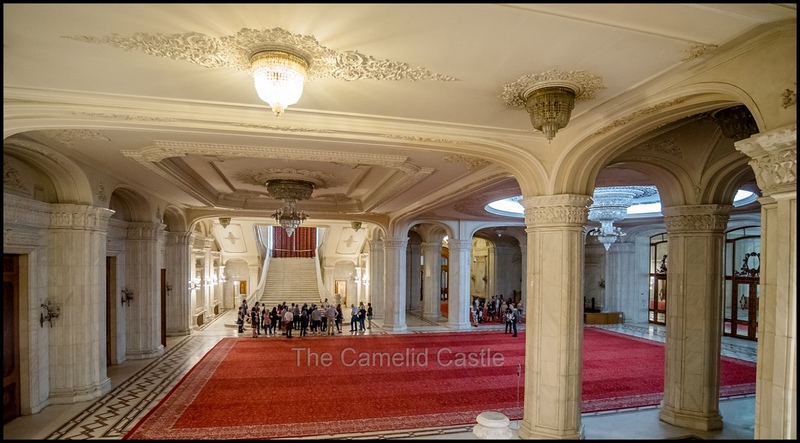 Our tour guide explained that the carpets generally handwoven and the enormous curtains consist of hand made tapestries. It was amazing seeing all the detail up close and you could definitely see that no expense had been spared with the finishes. 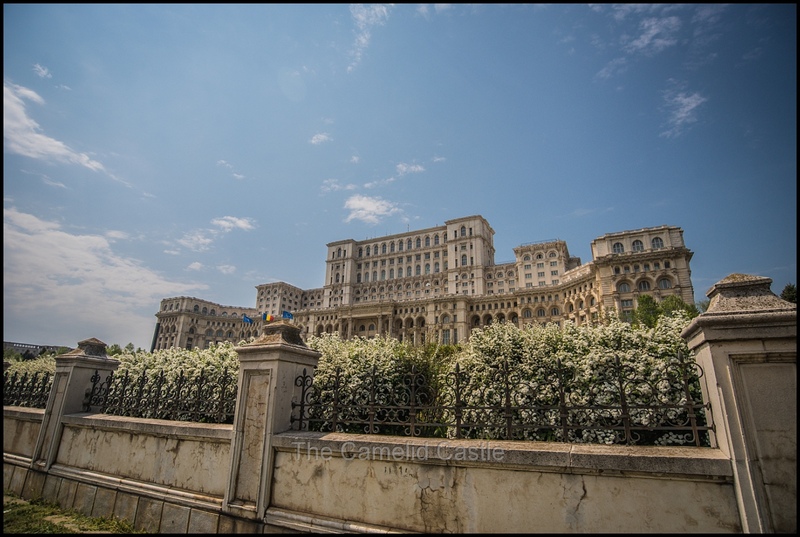 However, despite the massive cost and time frame for construction no air conditioning was ever installed as Nicolae Ceaușescu, the Communist dictator who commissioned the building, was afraid air conditioning would be used to poison him. The building also had cables taped to the floor everywhere, as despite being built relatively recently there was inadequate provisions for modern technology. 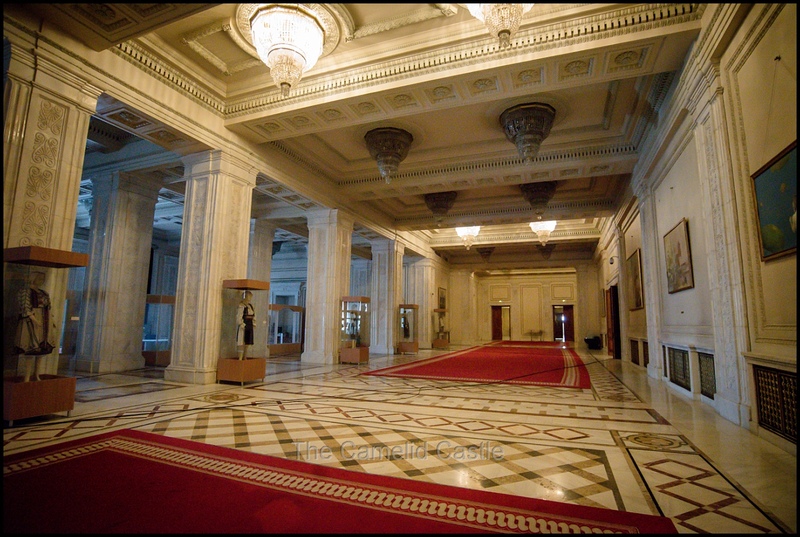 The building of the Palace is located in the central part of Bucharest (in Sector 5). 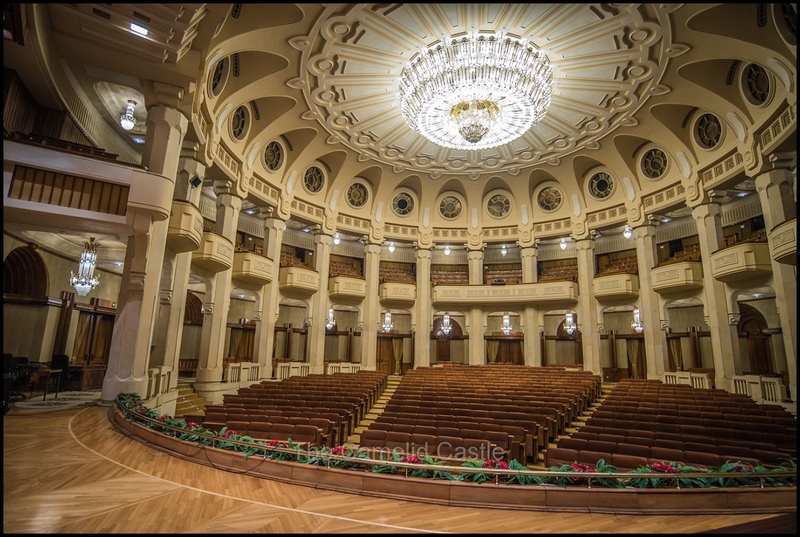 It is situated at the west end of the 3.5 kilometre Unirii Boulevard, constructed simultaneously with the Palace. The boulevard is meant to mimic the The Avenue des Champs-Élysées in Paris. Our tour took us out onto the balcony for the view along the boulevard. I can say with certainty that it’s not quite the same as the view in Paris, there were a lack of posh shops and what appeared to be car parks everywhere! 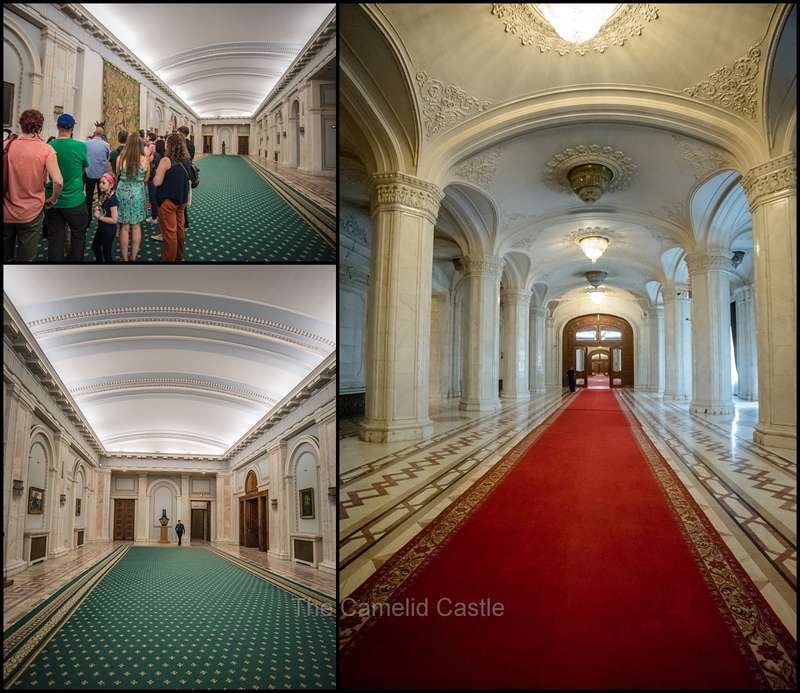 The tour took around an hour and covered only 5% of the building despite seeing large numbers of rooms over a couple of different floors. The tour was a sanitised version of the history of the building and the communist era, but there was still obvious contempt for the fact that such a large and expensive building was constructed (primarily using forced labour to minimise cost) and an estimated 3,000 people died in it’s construction and approximately 40,000 were relocated. 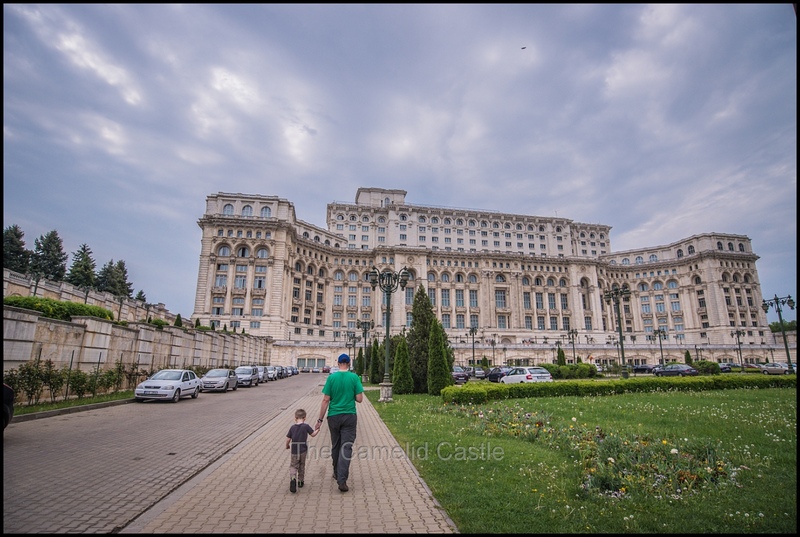 As we left the Palace of Parliament we had a wander back past the front of the building before deciding to head to the old town for some sightseeing and lunch. 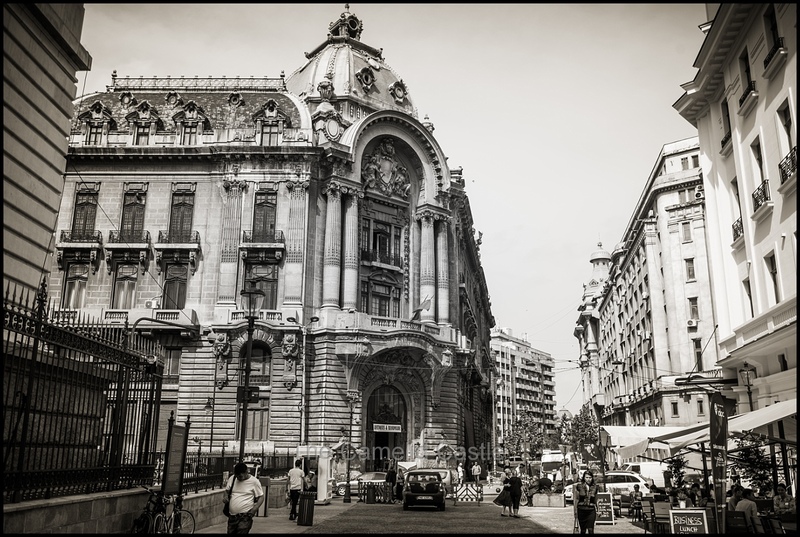 The Bucharest traffic is somewhat crazy and even though we stuck to crossing at traffic lights and pedestrian crossings, it was generally step out and pray as drivers paid little attention! 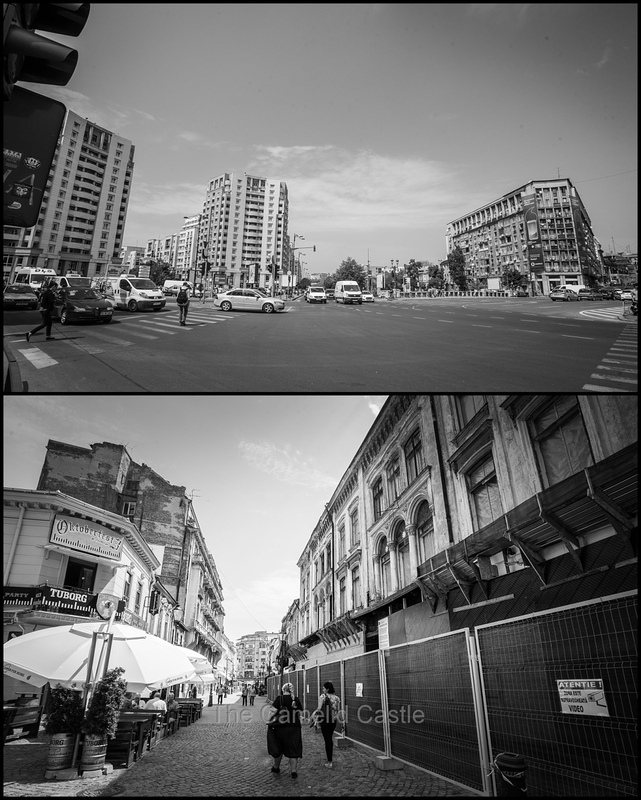 Bucharest’s Old Town or Centru Vechi (the Old Centre) is pretty much all that is left of pre-World War II Bucharest. Allied bombing destroyed much of the city and communism resulted in destruction of large sections of the city. The Old Town is in fact one of the newest in the world, with much of it being rebuilt post the year 2000. We were all a bit hungry so we found somewhere for lunch. It was now 1.45pm and we hadn’t really sat down since leaving the apartment that morning. Astrid and I shared a lunch deal of vegetarian pizza (curiously served with side sauce, we chose aioli) and a pannacotta with berries for dessert. The boys shared a meat platter with pork, chicken, smoked sausage, chips and cheese stufffed mushrooms. The restaurant was not in a hurry so lunch took awhile but we were all well and truly stuffed by the end. It was now around 3pm and we decided to finish our wander through the Old Town. Prior to the Old Town’s redevelopment over the past 20 years, it had become a no-go area for tourists but was now filled with plenty of restaurants, cafes and night clubs. Much of the development has been ad hoc though, with posh restaurants often in buildings that looked like they were going to fall down at any moment. 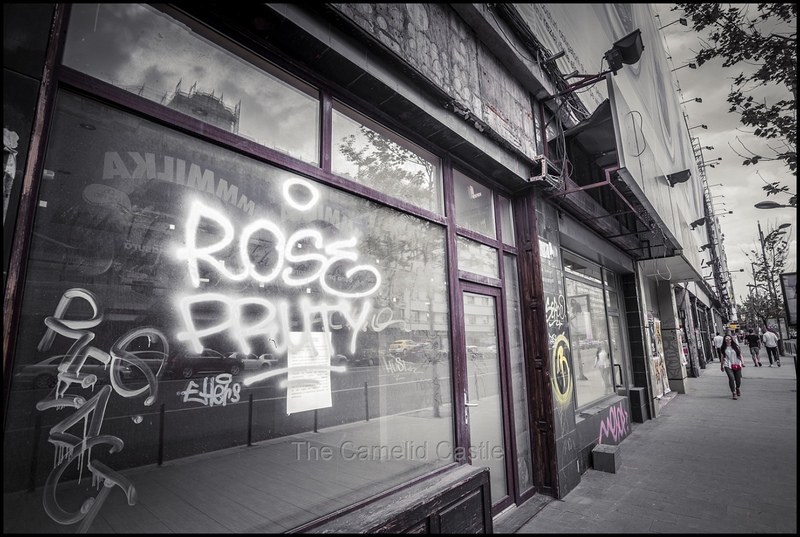 The city has started marking buildings with a red disk that are considered an earthquake risk and as you wander around you see plenty of boarded up buildings and graffiti. It’s also obvious that many of the older buildings are actually quite new and made to look older. The Old Town area is quite small so aside from checking out the buildings and wandering through a couple of markets it didn’t take us all that long. The sun was now out and it had warmed up considerably so we walked back in the direction of our apartment. True to what our taxi driver from the previous day had told us, peak hour was upon us and traffic was starting to bank up considerably. The city was full of contrast with areas that were extremely run down squished in between very expensive looking hotels and apartments. There was graffiti absolutely everywhere and we lost count of the boarded up buildings pretty quickly. We reached our apartment around 4.30pm and were glad to be back in the cool. We convinced the kids to have a little rest before heading back out for dinner. 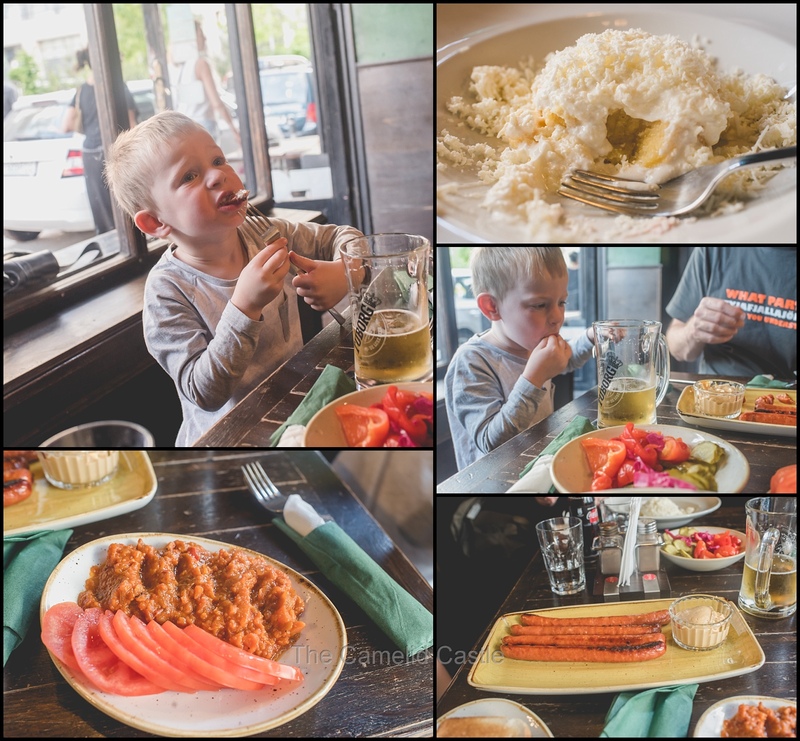 Despite our late and large lunch, we thought we really should go out for dinner as we had a lack of options in the apartment. Our research had lead us to a French Bistro called ‘Voila’ that was nearby, with excellent reviews. It was a rather eclectic little restaurant with lots of outdoor garden seating decorated with lanterns and candles. It turned out to be one of the best meals of the whole trip! We arrived a little after 7pm and were happy to sit in the pretty garden with virtually all the other patrons. It was still a pleasant temperature and a lovely time of night to be outside. The menus were only on blackboards and all in Romanian! The lovely waitress spoke very little English but managed to mostly translate the dishes into French which we understood better than the Romanian. Of course by the time we got through the translation of the multiple courses we had forgotten what most of them were, but did manage to order some great dishes and at least some vegetarian food for me! We ended up with a baked camembert with walnuts, rosemary honey and truffle oil and a pork pate with pickles for starters to share. Both were really good. After eating the kids were distracted by playing with a baby from the next table who was happily leading them around and whose parents were glad for the break! Daily statistics for the Thursday the 26th and the Friday 27th of April, 2018 in Glasgow Scotland and Bucharest, Romania – the 26th started out at a mild 6 degrees in Glasgow. 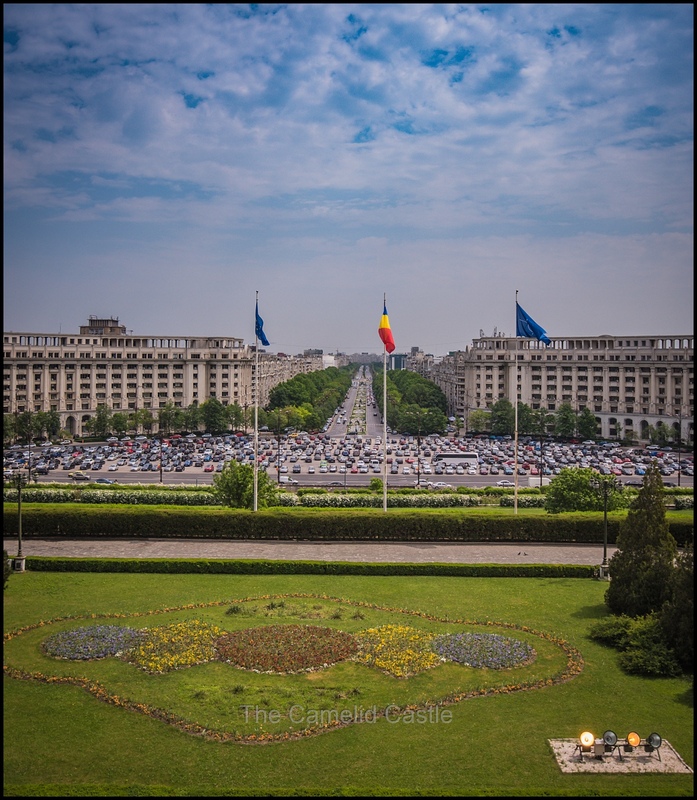 When we arrived in Bucharest it reached 29 degrees, with an apparent temperature of 34 degrees, a big shock to the system! 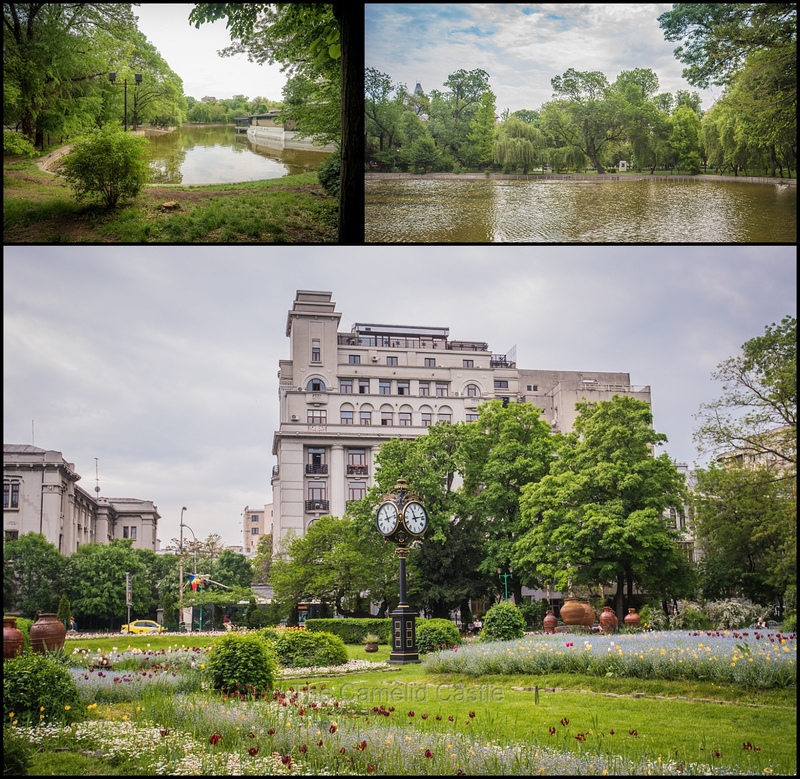 Friday the 27th in Bucharest had a more pleasant temperature range of 12 to 24 degrees. The total walking for the 26th was an average 5.2km but with most of the day spent in airports and on planes it wasn’t a terrible effort. We made up for it with an impressive 12.3km on the 27th as we walked our legs off around the huge Palace of Parliament and the Old Town. 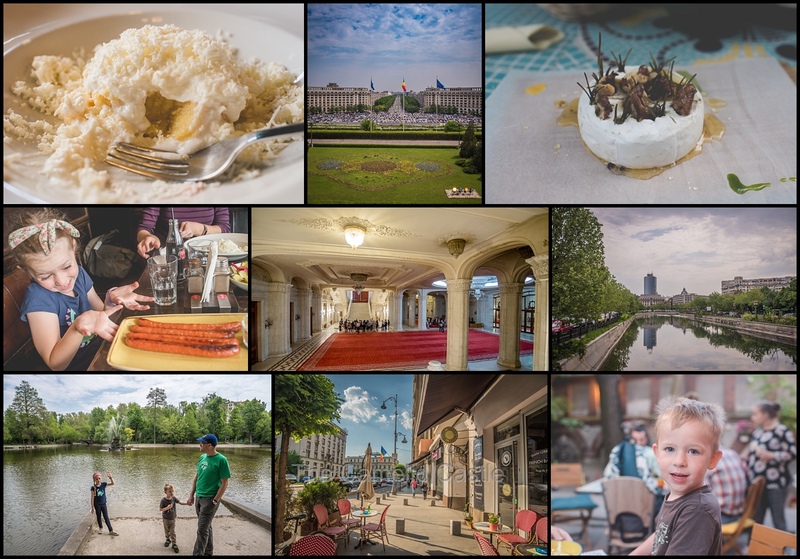 Up next, the final days of our trip, with a last day of exploring spring-time Bucharest with plenty of parks and delicious food and then the long trip home via Doha and Sydney. 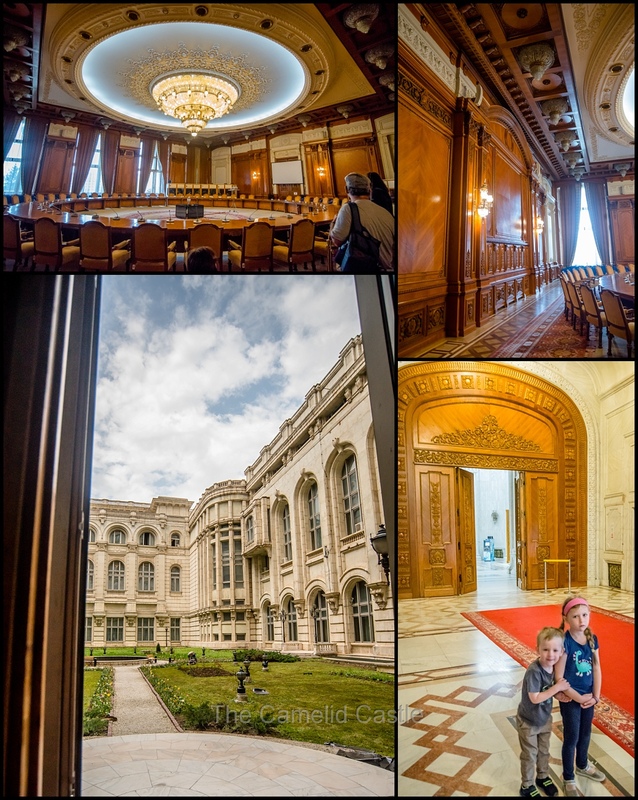 Posted in 4 years, 6 years, Anto, Astrid, Bucharest, Europe, Flights, flying with kids, Glasgow, Palace, Palace of Parliament, Park, Romania, Scotland, Soren, Travel, travelling with kids, UKBookmark the permalink.